Bring on the Mod Podge! 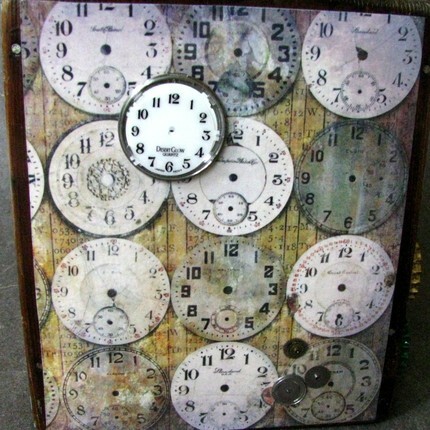 I adore using Mod Podge and use it almost as much as I use Gorilla Glue for my art projects. When I think back, I've been using Mod Podge forever...I created gifts for my girlfriends in high school and college using it! 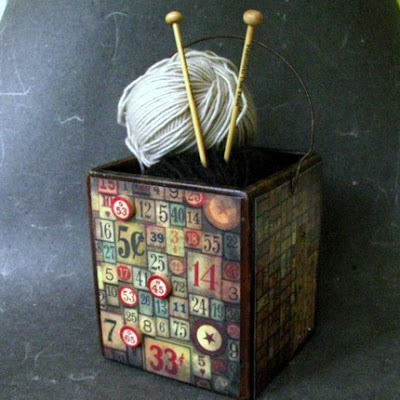 I used matte Mod Podge to create this fun and funky container. 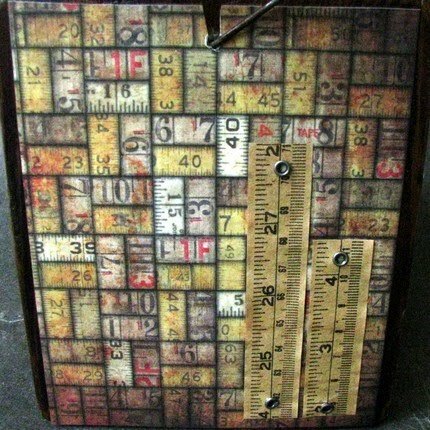 I started with a small, handmade, vintage, wooden (wow, that's a lot of adjectives) box that I found at a garage sale. I paid more than usual for that type of item, but something "spoke to me." It already had a very dated decoupage on one side, so I had to sand it the best I could. After sanding and cleaning, I went to work. Taking my trusty bottle of matte Mod Podge and a handful of scrapbook paper that I deemed worthy from my stash, I cut and sized paper to each side. Careful consideration went into each paper I chose because I needed to find or have something vintage to add to it to create the three dimensional aspect. I distressed the papers with ink and then used Mod Podge to adhere and finish. The result is something I truly love! Each side of this little box has it's own personality. I embellished every side with something vintage -- bingo pieces, a tape measure, old watch parts and bottle caps. 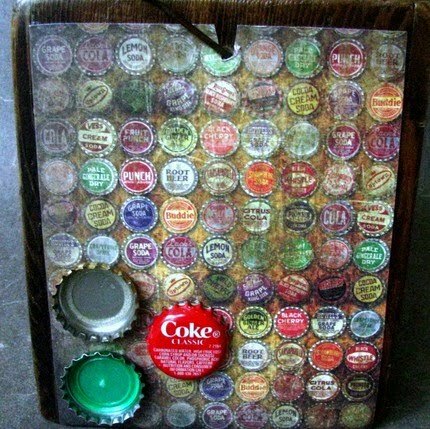 (no, the coke one isn't vintage, but it looked vintage to me). I had the best time today! Started at 8 am at a tag sale and stayed for one hour! This lady had so much vintage jewelry and vintage everything that I just couldn't leave. I purchased a gift bag full of vintage earring pieces for $3.75...so many possibilities! I also got a beautiful wood/metal candelabra that was made by Lenox. It's a bright yellow with fake plastic lemons, but again, the possibilities! I'll show you a before and after. Went to another sale on the way home and picked these awesome vintage croquet balls...I'm keeping three and selling five in my shop. Finally, I had to run back out to get some dinner ingredients and wouldn't you know, there was an estate sale right down the street! I think I'm a little insane. The lady was packing up and I got some sweet bargains that I'm actually keeping for myself. Two absolutely beautiful ceramic china pieces for a whooping total of $1.50. I won't even tell you what I passed up...some day I will kick myself, but you've got to have a limit (or a super huge house). Anyway, a fun and productive day. I even made two more shabby chic magnets for my store! The rest of the day we spent playing cards and cleaning the basement (it flooded last week, so we had to purge a lot...thank God, nothing valuable). Tomorrow, it's a family hike out to one of our favorite spots -- Great Falls, Md. Well, need a good night sleep, so catch up with you on Monday! Okay, I think I inherited my Dad's optimism. 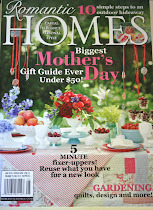 I keep thinking that any day I will look at this blog and find 50 followers! Come on, I'm counting on you guys to carry me to that magic number! Remember there's a giveaway...but, you won't find out what it is until I reach 50. 1. Painted the box black with black gesso and an acrylic paint. 2. Stamped the box with a French script block and a permanent white ink. 3. Then I cut out a vintage photo from some scrapbook paper I had laying around (but you can use an actual photo if you have one.) I distressed the edge of the paper and used an antiqued, distressed ink around the edges. 4. Then I stamped another piece of scrap paper with my "girlfriends" stamp and did the same treatment to that paper. 5. I then coated it all with Mod Podge, twice. 5. I affixed pieces of vintage jewelry to the top and as a little knob and there you have it! Next time, I'll do a step-by-step with pictures! Oh, I did the same thing with my French-themed box (above to the right). We had a whirlwind trip to New England to take my oldest to college. Drove up yesterday and came back today...I'm exhausted. I plan to go back for parent's weekend in October when I can spend just a little more time with him, and actually enjoy the area. I miss him and his great sense of humor already! My other son's started school this week, too. Both seem to be very happy with their teachers and class. I have some news...I just lost my studio space and I am moving everything out tomorrow and into my garage (husband isn't too happy). 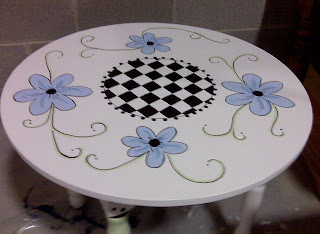 As a result, I'm trying to sell all my hand-painted furniture and just concentrate on my etsy stores. 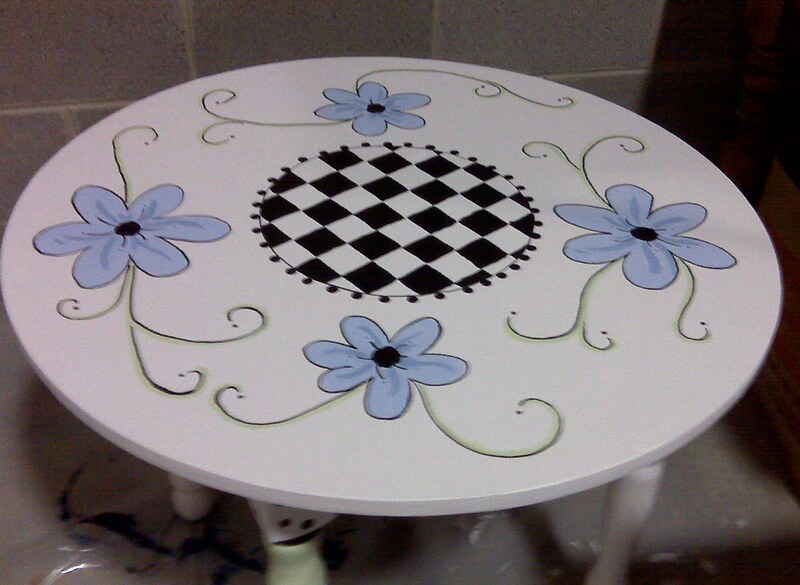 As much as I love to hand paint furniture, I just don't have a place to do it and the time to actually market it. I do have some unpainted things that I will probably finish up within a few weeks and post them on my local Craigslist. If they don't sell, I'm going to bring them to a craft fair in December (but, I just want to sell them so we can park our car in the winter). Anyway, things happen for a reason...maybe it's just my time to move on to a new creative outlet (or perhaps one that takes up less space)! One of my favorite pieces is pictured here. I meant for it to be a child's table, but I think it would look kind of pretty in a shabby chic household just about anywhere! Okay! I'm about to hold my first giveaway, BUT, I need 50 followers first, so fellow followers, can you please, pretty please with sugar on top, get the word out! Once I reach that magic number, I will post the prize and the contest rules - ONLY followers are eligible to enter and win! Above, check out this fun frame I just made for my other shop! 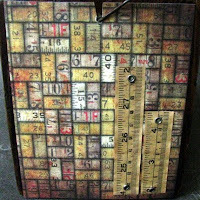 I used scrapbook paper and vintage bingo pieces to transform it into something whimsical! I do love rainy days. I have so much to do and it feels great to be inside and be productive. Our power was out until about noon because of the rain (our power goes out just about every time the wind blows), so the kids amused themselves by playing board games and tag. The teenagers amused themselves by sleeping in. Me, I went to work taking photos of my new shabby chic magnets for my Country Chic section of my shop. I made the magnets last night in between writing articles ... I needed a break ... sitting at my computer for more than a few hours gets to me (unlike my teenagers who could sit for days). Anyway, here's a few pictures of the magnets that I made from the plethora of vintage jewelry and vintage rhinestones that I have stored in my closet. They were fun to make and actually fun to photograph! I'm going to make a few a day until I run out of jewelry. That should take about a couple of months! Good news! My shop, Country Tag Sale was just featured in another Etsy Treasury (free publicity). That makes 7 in the last couple months -- 8 total!! Even bigger news...I made a sale at my other shop, Where The Grass is Greener. I sold the jewelry box that I promised to show you all (the one that I decoupaged with vintage papers, specialty papers, gold leaf and embossing). Well, it's packed and ready to ship to the buyer, but here's a peek! Well, I've got to get back to writing...deadlines loom. Sunday was a great rainy day to stay inside and paint, so, after my son's soccer game, I took full advantage of the gloomy day and finished a couple projects..a small keepsake box and a new mirror to add to one of my shops. I also finished painting my nephew's girlfriend's nephew's (get that?) step stool. 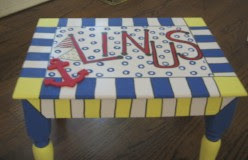 Little Linus will be celebrating his first birthday and I'm honored to be making a nautical-inspired step stool for him. I chose to use the primary colors of true blue, true red and pineapple to keep the color simple so I could add a lot of detail. I have yet to add several coats of polyurethane (A must, since he'll be stepping on it all the time). It is a bit delicate so I asked my husband to reinforce it a bit underneath with a sturdy piece of wood...now it can withstand the abuse of a toddler (don't abuse it too much, Linus)! Do you think I should keep the polka dots on top hollow or should I fill them in with a solid blue? 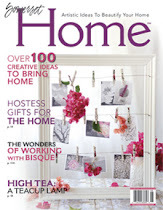 I absolutely love the shabby chic look...In fact, I've always loved it before they called it shabby chic. Those soft pastels, creme and white just give me a sense of calm and cleanliness. My home is a mix of shabby chic and rustic cottage country...the latter is practicality...I mean stuff that's well worn and distressed just fits in a home with three four boys. I found these wonderful vintage resin frames and I've been collecting them whenever I see them. To most, they are pretty ugly (I guess that's why I always find them in thrift stores), but to me, I saw possibilities. I really had no clue what I was going to do with them until a couple weeks ago. Then, I got my trusty can of spray paint, my glazing tools and some beautiful vintage style paper and went to work. The centerpiece in each piece is where the real fun begins...I look through my large collection of broken vintage earrings, pins, etc. and find just the right item to showcase. The results are what you see in this posting and it even inspired me to open a new section in my Country Tag Sale shop, called Country Chic. I plan on listing something new every day in the section until I run out of inventory...then I've got to find more ugly resin frames and old drawers to transform. However, the tag sales will have to wait until the soccer game has ended. Soccer season is just starting and that will now be priority on Saturday mornings. On another note, my home looks like a tornado and a hurricane went through it, but I finished a lot. However, when my son commented on how messy it was...that really scared me into cleaning. I better go. As most of you know, I live in a house of males...except of course, my dog. It can be tough some times; for example, they love to pick on me and when one starts, it sets them all off. You kind of have to develop a tough skin...hmm, after all these years, I still haven't quite got it. I also long for feminine colors such as pink and pale green (even though my favorite color is blue!) So, I get in touch with my feminine side with my art. For example, here are two mirrors that I got at a Goodwill store. They were pretty beat up and chipped. So, I just started playing around with what I had on hand...some paint samples, a broken dragonfly wand (it was being thrown away) and ribbon that I found in my gift wrapping drawer. Oh, what a coat of primer and some pretty pale pink will do! 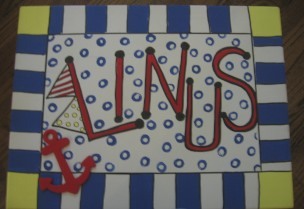 And, you'll never guess how I made the polka dots. A Nerf dart! (Told you that you wouldn't guess.) It was just laying there on the floor (like everything else in our house) and I picked it up and started dipping it in my paint and stamping. You never know. Two weeks ago, I found this sweet table that I knew would fit in my living room. A steal at $10. It does need to be repainted on the top, but for now, I'm strategically placing some pictures and lamps on it. Speaking of lamps, see the two on the table? I got them for $2.50 each! Yes, you heard me! They had a price tag of $5 and I asked the woman, "is it $5 for each lamp or $5 for both?" She replied, "If you take them right now, it's for both." My wallet never opened so fast. I also came upon a huge vintage sale where I picked up a few pieces for my etsy shop, Country Tag Sale. It was actually overwhelming; there was so much to look through. I finally grabbed what I had in hand and left. I could have spent all afternoon at this place, but then if I did, my house would have looked like this garage sale. There were literally hundreds of books and knick knacks. My favorite find was this beautiful glass basket to the right. I think it will look lovely for fall, but of course, it's for sale, too. After 6 days without the little guy around, I managed to get some work done. Yes, I did have some hiccups -- running to the orthodontist for my older son's last minute retainer replacement, sitting in a lot of traffic, two power failures, loads of laundry and a paint pen explosion. Yes, I was putting the final touches on a sweet little mirror that I plan on selling in my etsy store and my paint pen just exploded (not literally), but all the paint began to drip out on my finished product! Luckily, it happened in one corner, so I covered most of the mess with the frog (see picture on right). However, I still had a black blob behind the frog. My son suggested that I make it into a plant behind the frog, so I just started painting (with a new paint pen) and the result is what you see! Can you tell? I'm heading to Pittsburgh today to visit my parents and my in-laws for a few days...just me and two boys...maybe, I'll come up with some new inspirations. I had some fantastic finds at the estate and garage sales yesterday...I'll post those when I get back, so tune in...you won't be sorry!